All of the Cell Pairs except 1 were showing red and this was consistent for the 2km test trip we did. This all seems a bit weird for a 3 year old car with 40k+ km on the clock? Any ideas on what is going on? After the drive I noticed that I had the LeafSpy Pro set to 2011 Year. would this have effected any of the values returned by LeafSpy Pro? Also note that this is a ex Japan import (as are most of the Leafs on sale here in New Zealand). 1) The battery was just replaced and the car has not been driven more than a few kilometers. 2) Someone fraudulently reset the LBC (lithium battery controller also called the BMS or battery management system). If so, the AHr, SOH, and Hx numbers will drop rapidly as the car is used on a daily basis. 3) The car has way more charge cycles than one would expect for the number of kilometers it has been driven. The car may have only been driven very short distances and recharged so it has never been discharged enough for the LBC to determine the true battery capacity and condition. If so, the AHr, SOH, and Hx numbers will drop as the car is used and the battery is deeply discharged once in a while. 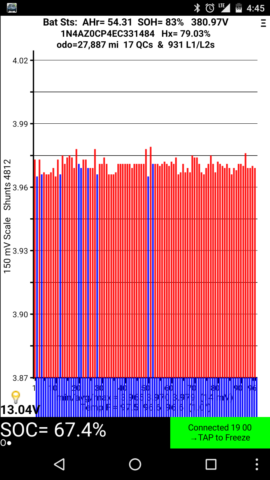 I doubt that having Leaf Spy set for 2011 would cause incorrect readings of AHr, SOH, and Hx values. 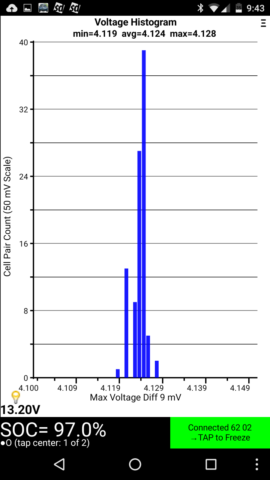 It is normal to have many of the cell pairs showing red (shunts active for cell balancing) under certain conditions so that by itself is not a concern (my 2015 shows mostly red when I start driving after charging). To give you some numbers for comparison, here are the latest from my 2015 when parked last night with new values in parentheses: AHr=55.28 (64.38), SOH=89% (100%), Hx=83.37% (101.25%), odometer=25,590 miles (9 miles when initial Leaf Spy readings were taken on February 7, 2015), QC=23 (1), and L1/L2=432 (4). 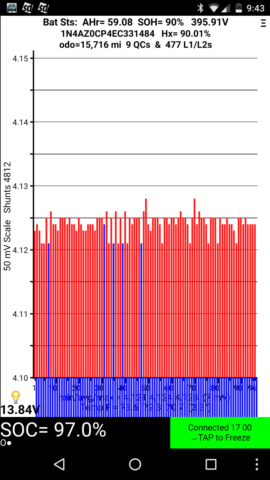 Battery temperatures when parked last night were 108.6 F, 106.7 F, and 104.9 F.
Thanks Gerry for your insights! 1) battery would have had to have been replaced in Japan just before it was shipped to here. I think the car has been with the dealer/importer for just under a month and I think it has done about 170kms since getting here - is that few enough? 2) this was my suspicion but most of the dealers here with Leafs for sale are ICE dudes and know very very little about EVs at all. So far the main selling point the sales dudes have tired on me is that the Leaf accelerates really really fast! Could the LBC have been reset just before it was shipped from Japan and still be showing those numbers? How easy is it to reset the LBC? 3) you have a good point here - would you expect under a 1000 L1/L2 charges for a car of this age? Again, my point about the NZ dealers - almost certainly they are charging to 100% most days the car is used and the sales dude said that his boss had been using this one a bit. I would have thought that the numbers would have dropped a bit from 100% though. The main thing I found odd with the cell pairs showing red is that the trip log csv file seems to show that all the cell pairs, except one, had shunts active for all of the 2km trip and that the blue pair was always the same pair. Only just done the sums on the L1/L2 charge number - 3114 charges, assuming 4 years (being generous) that is 208 weeks = approx 15 charges per week on average. Seems very excessive. My best guess is that the exporter in Japan or the importer in New Zealand reset the LBC (using Consult 3+ which most dealers and many independent shops have). I think it could easily go 170 km without capacity numbers dropping if the battery was never significantly discharged. As I said before, the cell-pair shunting you noticed is nothing to be concerned about--I consider it normal because my 2015 often does that after charging. One way to confirm the battery capacity is to start with a full charge and drive until you get down to LBW or VLBW (low battery warning or very low battery warning). Compare the driving distance with the range charts Tony Williams created to determine the true battery capacity. The high charge count could be partly explained if charging and climate control timers were used a lot because they can add extra L1/L2 charge counts. The 106 quick charges is also a little more than I would expect, but not really detrimental. 25,000 miles divided by 3220 charges is only 8 miles per charge average. If each charge cycle increased count by 3 due to timer use, the average travel distance per charge goes up to 24 which is more reasonable. GerryAZ wrote: My best guess is that the exporter in Japan or the importer in New Zealand reset the LBC (using Consult 3+ which most dealers and many independent shops have). I think it could easily go 170 km without capacity numbers dropping if the battery was never significantly discharged. 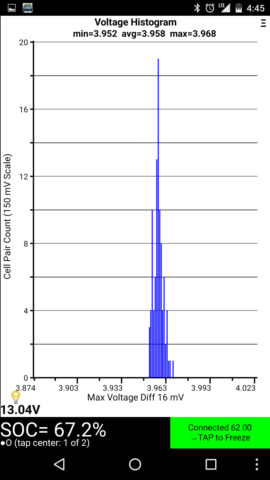 As I said before, the cell-pair shunting you noticed is nothing to be concerned about--I consider it normal because my 2015 often does that after charging. One way to confirm the battery capacity is to start with a full charge and drive until you get down to LBW or VLBW (low battery warning or very low battery warning). Compare the driving distance with the range charts Tony Williams created to determine the true battery capacity. The high charge count could be partly explained if charging and climate control timers were used a lot because they can add extra L1/L2 charge counts. The 106 quick charges is also a little more than I would expect, but not really detrimental. 25,000 miles divided by 3220 charges is only 8 miles per charge average. If each charge cycle increased count by 3 due to timer use, the average travel distance per charge goes up to 24 which is more reasonable. Thanks again for the info Gerry. I will have a wee look at the range charts but because the car is at a dealers I don't really have an option to do a LBW or VLBW test, unfortunately. I have a few other options here so will go take them for a drive and see what numbers I can get from them. Seeking some expert advice on what to make of this Leafspy data. Attaching a set of screen shots from Oct. 2015 and the same from August 2016. Am I looking at a bar drop some time soon? What do these numbers and variation means? Seems like this thread should be merged with viewtopic.php?f=44&t=12789 or one of the Leaf Spy threads. Have you looked at http://www.electricvehiclewiki.com/Leaf_Spy_Pro as well as the help built into the app? Also see viewtopic.php?p=455984#p455984. The variance in voltage between cells is normal and always going to happen. However, if one or more is WAY out of whack, that generally indicates a faulty cell. 16 mV max variance is totally normal. I did try to look up the links you posted. It seems the screenshots provided are older and the software has been updated. I just need to understand what the difference in AHr , SOH, V and Hx numbers means? Meantime I just realized I've lost a bar ! !